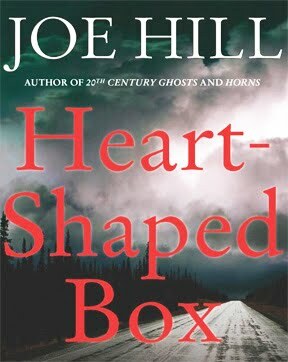 Joe Hill’s novel, Heart Shaped Box had been on my Kindle Wish List for some time. When I saw it offered last week for $1.99 I couldn’t resist the purchase. I knew from the start that based on the reviews I had read that this book was going to be a bizarre thriller.That turned out to be an understatement. The book was a roller-coaster of the occult. I can’t say it kept me up nights or woke me with nightmares but I also can’t promise that won’t happen to you should you read Heart Shaped Box. Judas Coyne is a 54-year-old former leader of a heavy metal rock band. He has a penchant for collecting bizarre artifacts of the occult including a hangman’s noose, skulls and a “snuff” film. He also has a habit of collecting “Goth” groupies less than half his age. Judas seems to have so little respect for his collection of lovers that he tends to call them by the name of their home state rather than their given name. His last two lovers were Florida and Georgia. When his manager informs him that a dead man’s suit supposedly containing his ghost has come up for sale on an E-Bay like website, Judas can’t resist owning it. The suit arrives packaged in a heart-shaped box and the biggest mistake purchase that will alter and possibly end his life is now sitting on his kitchen table. The ghost of Craddock McDermott has only one goal in this after-life, to bring about the death of Judas Coyne and those who give him aid and comfort. The aging rocker is not a very loveable character but throughout the book he grows on you as he learns to rely on his dogs, his girl and his cunning in his fight to the death with the ghostly demon out to destroy him. It should probably be said that I am NOT a fan of the horror story as a genre. For some unknown reason, I knew this book would appeal to me. I was definitely not disappointed. Joe Hill takes the reader on a 100 mile an hour ride on the “nightroad” that will have you turning pages to discover what horrifying acts will take place next. There were times when the gruesome action stopped just short of being too far-fetched but it managed to tip-toe along that narrow line of credibility and still stay focused. It is not totally surprising that Joe Hill would be capable of turning out a page turning book of thrill a minute terror since Joe is the son of someone who knows a little bit about writing horror stories. His dad is Stephen King! I enjoyed being frightened and gave Heart Shaped Box four **** stars.